I turned 45 last Wednesday and since then I have learned three DIY skills – how to attach a tow hitch to my car, how to tow a trailer and how to use a sod cutting machine. We also got my mom’s house on the market finally, and within 24 hours she had 12 showings and FIVE offers! It’s shaping up to be a pretty good year! Remember that little bitty DIY I talked about in May, installing a gravel patio and building a natural stone fire pit??? Well we had a few timeline setbacks, but we’re finally off and running!!! When we moved here six years ago our entire backyard was completely wooded all the way up to the house, and we’ve worked endlessly to take down trees, remove stumps, have loam brought in to regrade the land, and then grow grass…..and now I am ruthlessly ripping some of it out to make room for a patio. We truly can’t wait for this fire pit area – especially our three teenagers! The patio will go right at the bottom of our deck stairs, extending out into the yard, and we envision many fun times with friends and family in this spot. I’m DIYing every bit of this that I can and will be sharing the step-by-step over the next couple of weeks! The first action item in laying a gravel patio and building a fire pit is to clear the area where the patio will go by removing sod. 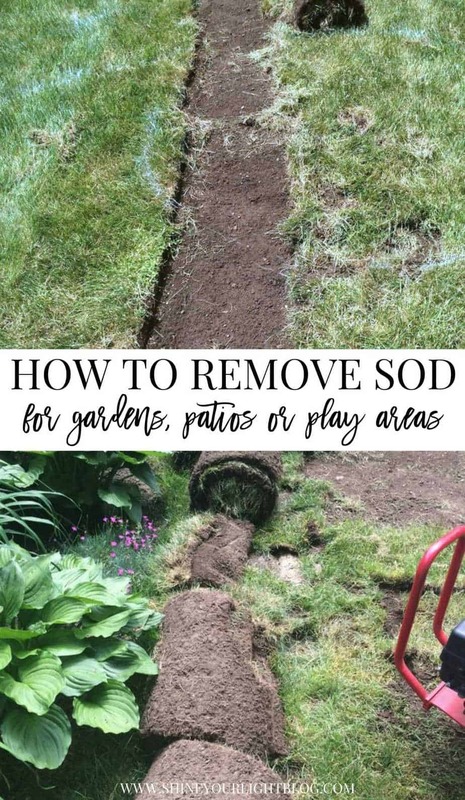 Sod removal is necessary for the patio to be flush with the yard, and for preventing grass growing through the patio. Even though we are planning to use fabric weed block too, we don’t want to contend with grass growing up through our gravel patio in years to come. 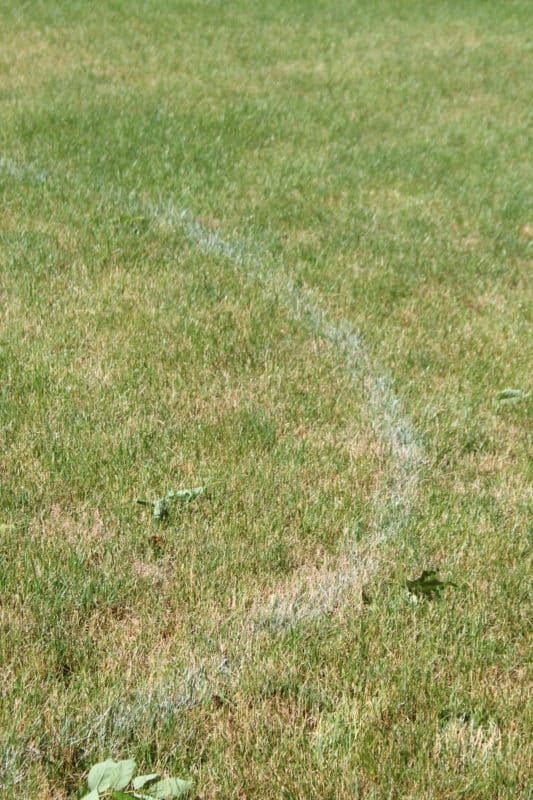 Start out by marking the area with spray paint right on the grass. I wanted an organic circular shape that wasn’t too perfect, and also allotted for a 2′ perimeter for a garden bed that will border the patio. After you are happy with the shape, mark any obstacles like sprinkler heads. I removed the stepping stone path and the sod around the stones, as well as around the sprinkler heads, with a shovel. 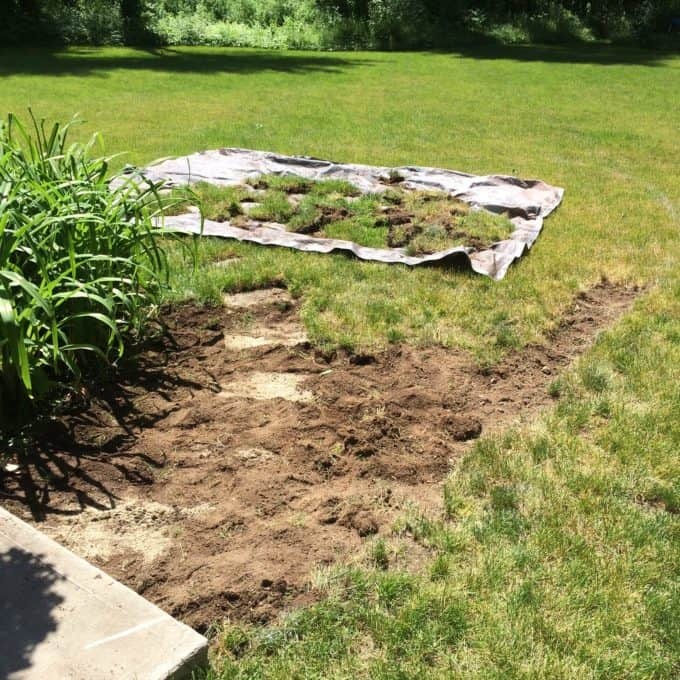 Supposedly it’s easier to remove sod when it’s moist (but not drenched) versus very dry, so the day after a rainstorm I tackled removing the stepping stones and sod around them. An hour and a half later!!! Barely making a dent in it! Rent a sod cutter and figure out how to get it home. All along I had planned to rent a sod cutter from my local Home Depot rental center ($69 for 4 hours) to remove the majority of the sod. While I am usually the home improver around here, I do call in the muscle when need be, but Mark was in the midst of a crazy time at work and had zero time to help me. After watching a couple videos I was feeling pretty confident about renting the sod cutter and tackling the removal myself. HAAAAAA!!!! Not so much. When I went to pick it up I realized I couldn’t just put it in the back of my SUV like I did with the wet saw…..the sod cutter weighs 300 lbs.! Okay then. 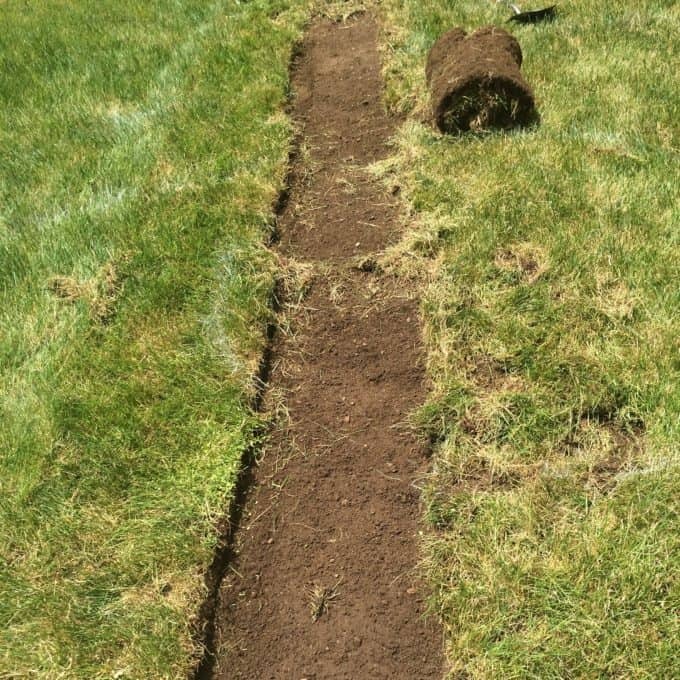 First lesson in sod cutting – you have to figure out how to actually get a sod cutter home, other than inside a car or SUV! 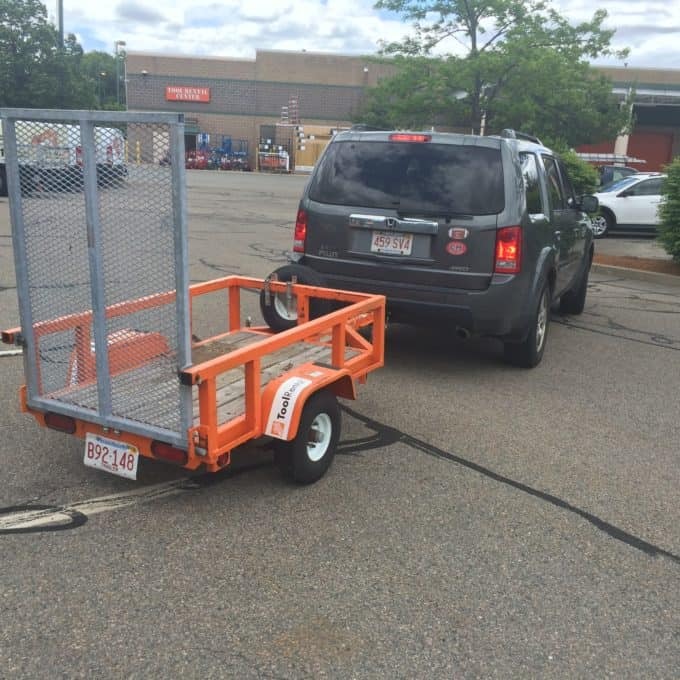 My neighbor offered his trailer for me to bring to Home Depot and tow the machine home, but I have never towed a trailer (or anything else) before and was petrified to try it!! 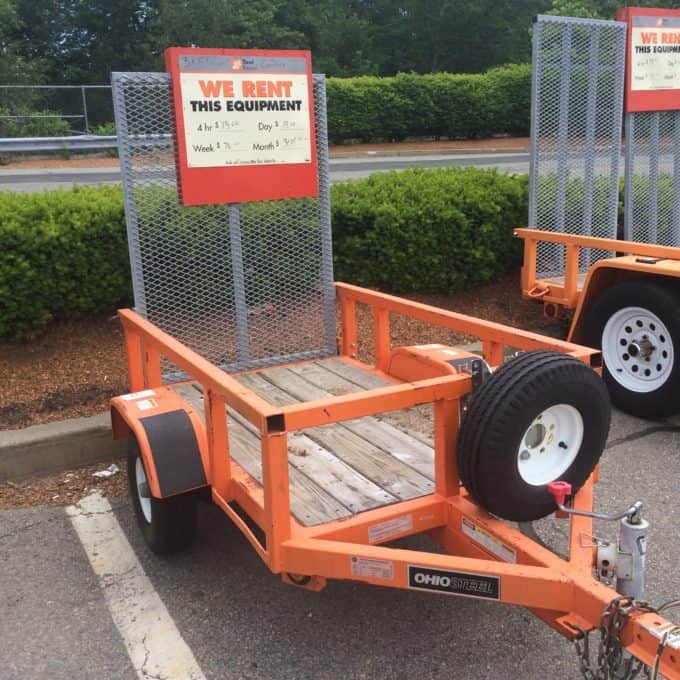 On my second visit to Home Depot’s rental center, I spied a little trailer, and thought I might be able to manage that. It’s $13 for 4 hours. Attach the trailer. The very first day my 17 year old son was out of school for the summer, I lured him out of bed with muffins and coffee, and off we went to HD. We own a tow hitch (we used to attach a bike rack to the car with it) so I googled how to install it and this part is super easy. You need a vehicle with a tow hitch receiver on it. You just push the tow hitch into the receiver and secure it with a pin. Done. 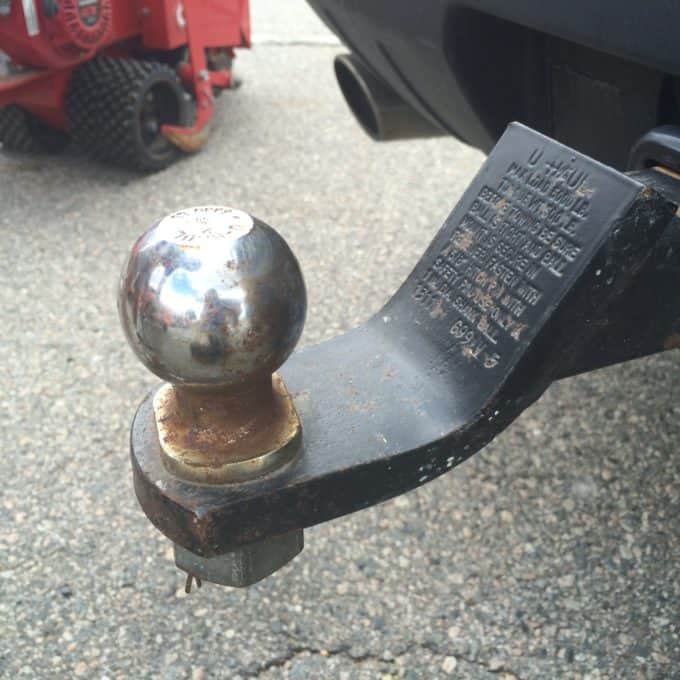 The guy at the rental center showed us how to attach the trailer to the tow hitch. First you back up your vehicle to the trailer. 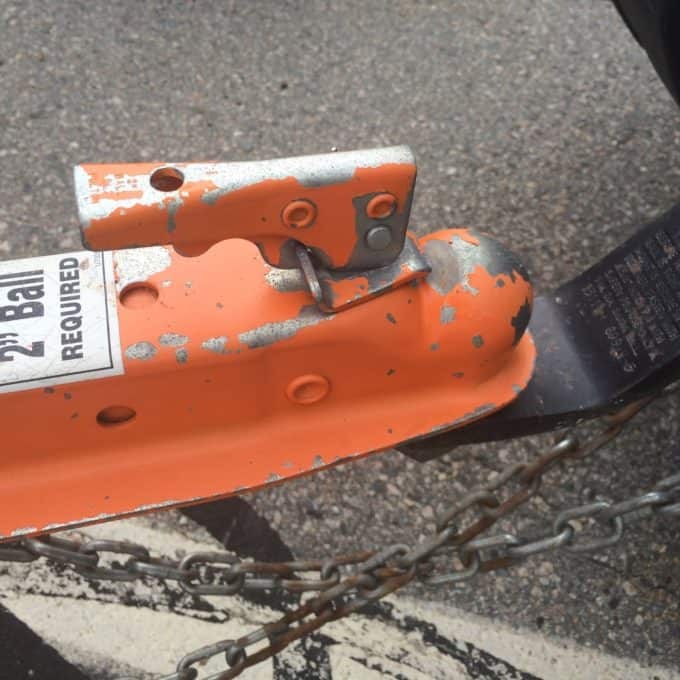 There are two safety chains on the trailer that hook on the vehicle (I’m assuming any vehicle that has the tow hitch receiver will have these eyes for the hooks). You cross the chains when hooking them. 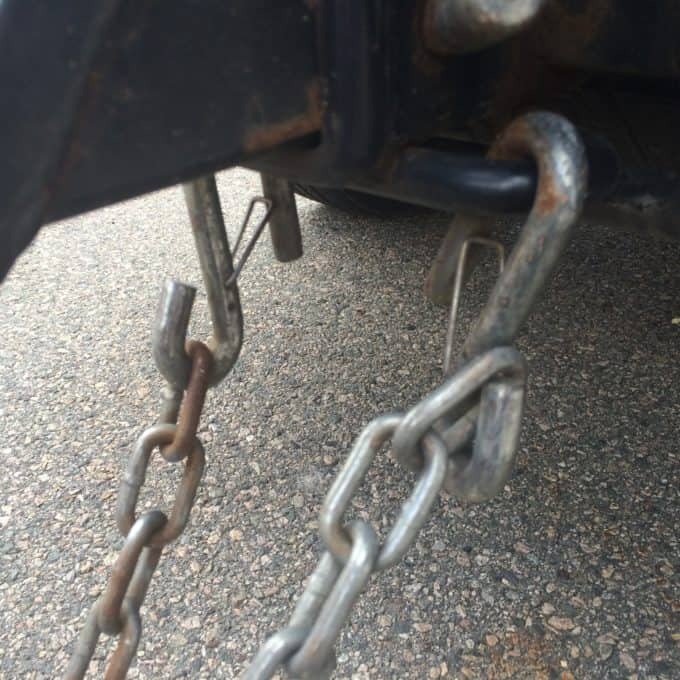 Then this piece from the trailer fits over the ball of the hitch, and is secured with a latch that clamps the two parts together nice and tight. 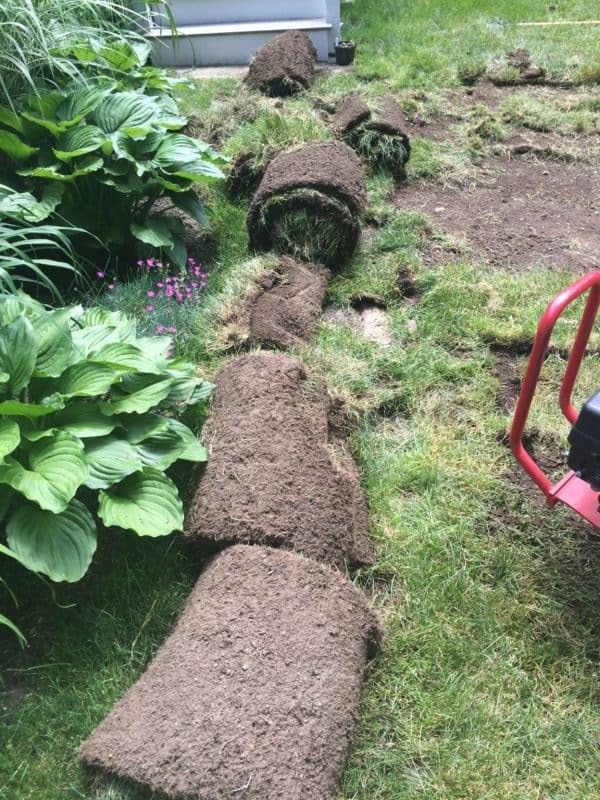 Load up the sod cutter. 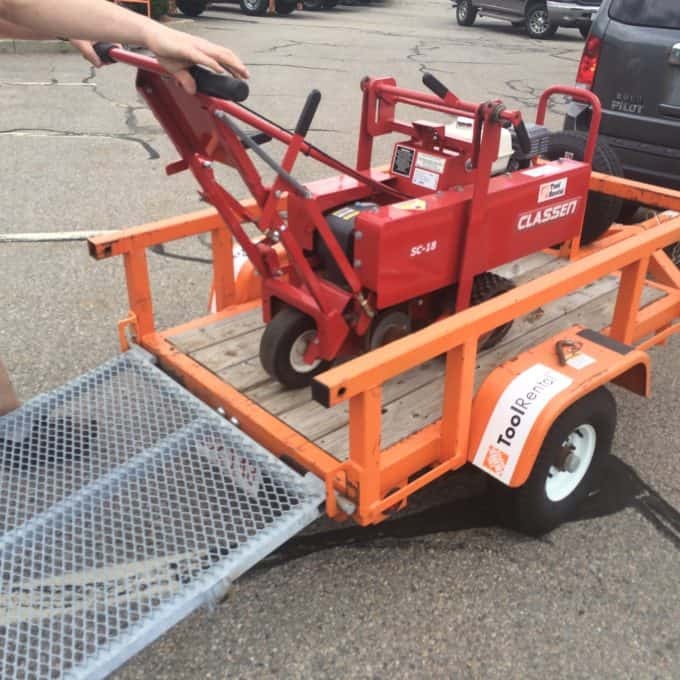 The back of the trailer is a ramp that enables you to push the sod cutter up on to the trailer without having to lift it. When closed the gate kept the sod cutter from moving, and we also used bungee cords to attach it to the sides of the trailer. We drove home about a mile an hour, but the trailer was FINE and traveling with it wasn’t a big deal at all, except that it makes a ton of noise when you go over bumps in the road and I was terrified it was going somehow flip out over the side of the trailer and cause a big accident. It barely moved! Cut the sod. Once we got it onto the lawn we had to watch the manufacturer’s video on how to use it again to get it going properly, but once we got the gist of it we were flying!! It’s not hard to use at all, just a lot of stop-and-go. With each row you cut, you have to stop, pull the machine out of the sod, pull the blade up, turn it around, reset it all and do it again. That part is tedious but overall this machine is magical and makes sod removal a million times easier than doing it by hand!!! A few times a piece of sod would get stuck in the blade so Peter would tip the machine back towards him and I would pull it out. It’s really helpful to tackle this with someone else so if you’re renting a sod cutting machine get a buddy to help you out. Roll the sod. After the rows of sod are cut, they need to be rolled up. We found that if we rolled an entire row, it was SO heavy and hard to move, so I ended up cutting the strips into 2-3′ pieces and rolling them. The small rolls are easier to carry. The whole cutting process took us about an hour, but cutting and rolling the strips took a lot longer. After we had the general shape done, Peter went around the perimeter and tried to make it more circular based on the spray painted outline I had made. Remove the sod. We used the little trailer that attaches to the back of our lawn mower to haul bundles of sod away from the patio area. We used some of the rolls to patch areas in our yard that had taken a beating over the winter, and then I posted the rest for free on the Facebook Yard Sale site I started a few years ago. Anything you put on there for free goes like lighting! It was all picked up within a couple of days and I’m glad someone else can use it. If you are hauling sod away from a site, remember it is heavy. A tarp works well for small quantities. A lot of hands make this work go more quickly – it is laborious, I’m not going to lie, but you can do it! Marvel at your newly cleared area! I have never been so happy to have a bunch of dirt in my backyard!!!! Mark and Peter carried over the pieces of the most exciting part of this project – the fire pit! I’ll be covering this modular fire pit kit from Stone Farm with natural stone veneer on the outside, and fire brick on the inside. Stone Farm is the licensed manufacturer and distributor for Stone Age Modular Fireplace Kits in the Mid-Atlantic, Metro New York, and New England areas. We chose to use a Stone Age kit because of the quality and reputation of their products. Mark and I loved the idea of using natural stone and after seeing the Stone Age fire pits in person we knew that’s the direction we wanted to go. I can’t wait to get started on that piece of the project. In the meantime the pea stone is on order and I’m working on a design for the landscape border. There is a lot of work to do yet but I think this is going to end up being my favorite DIY of all time! 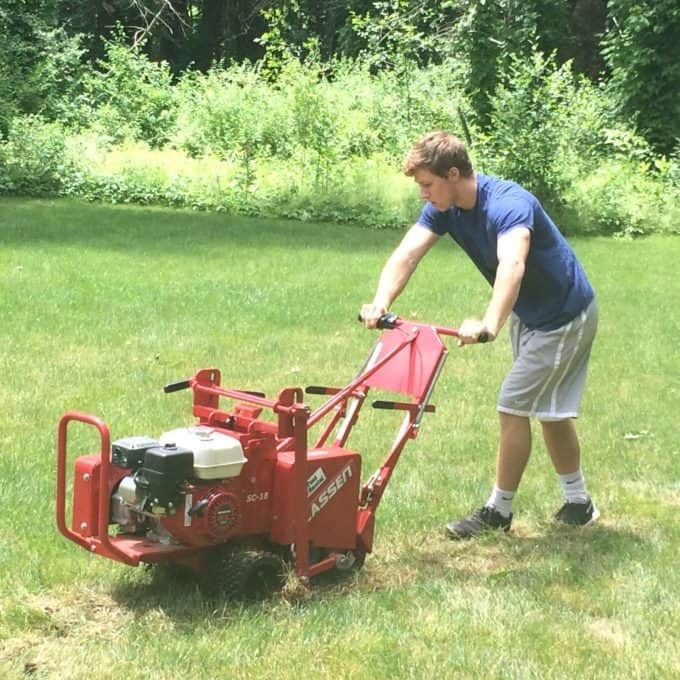 While cleaning sod is definitely a job you could do by hand, it’s a million times easier with the sod cutter, even factoring in having to pay for the rental and figure out getting it home. We went over the 4 hour limit so our total rental was around $100 for the machine and the trailer, but that was a lot less than paying a landscaper to clear it for us, and I’m glad we figured it out ourselves. It is definitely a LOT of hard, sweaty work to remove sod even if you are using the machine, but it’s doable and it is so gratifying. This is a GREAT project to work on with teenagers who want a fire pit to hang out around with their friends! I think Peter felt pretty good about the job he did and now he knows how to not only use a sod cutter but also attach a tow hitch and trailer to a vehicle. The silver lining to all this hard work is seeing my kids learn how to work hard, figure things out and become self-sufficient adults. That is a pretty awesome thing. Looking good Lisa! You are a rockstar! Thank you Stephanie…..kinda funny when a sea of dirt gets me all fired up! What a fun space this will be for you all! So excited to see when you’re done. . Happy Birthday btw! Thank you Stacey! I’ve been thinking of you and your house & kitchen reno! Hope you are back in soon! What an awesome project! There’s just something about a fire pit that really brings people together – can’t wait to see how it progresses! Happy late birthday to you! So impressed with your new skills Lisa! We spent last weekend working on our fire-pit as well. It’s going to be a little more “rustic” than yours. We re-purposed slate from other areas & I planted dichondra seed in the cracks. Hopefully I’ll have something to share soon. Looking forward to finishing this project before the summer heat sets in for good. Thank you Rene! We have literally nothing of interest in our backyard besides grass and trees, so that’s why we decided to go big on this project. 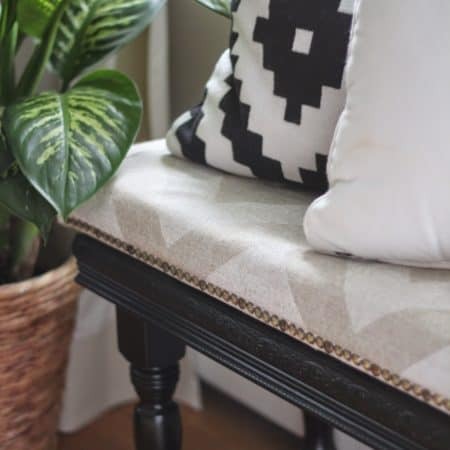 Your outdoor space is so beautiful already, a fire pit is going to be the perfect addition! Can’t wait to see. We are scrambling to beat the heat too! Lisa, I’m tired just reading about it! You are my DIY idol! Can’t wait to see you rework this whole space! Thanks Kris! It was definitely a good way to ensure a solid night’s sleep! Looks awesome. I want to come see it when it is done! I would love that Jane! Is there anything you can’t do?!! Totally impressed! Yard related projects scare me. And nicely done putting your son to work! He’s got to be feeling pretty darn good about it to! Too bad you don’t live next to me Julia! 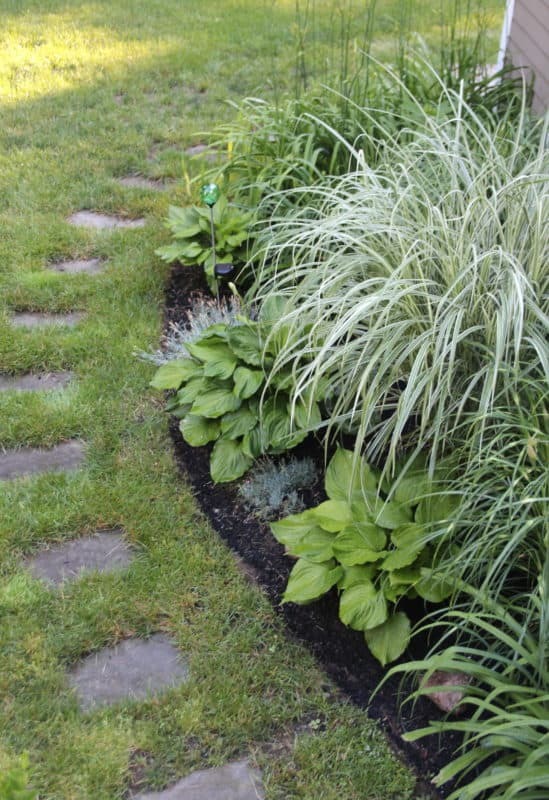 It worked out so great for a friend of mine that has dirt for a backyard….now she has grass! Monica it has been so much hard labor, I have never slept so well! 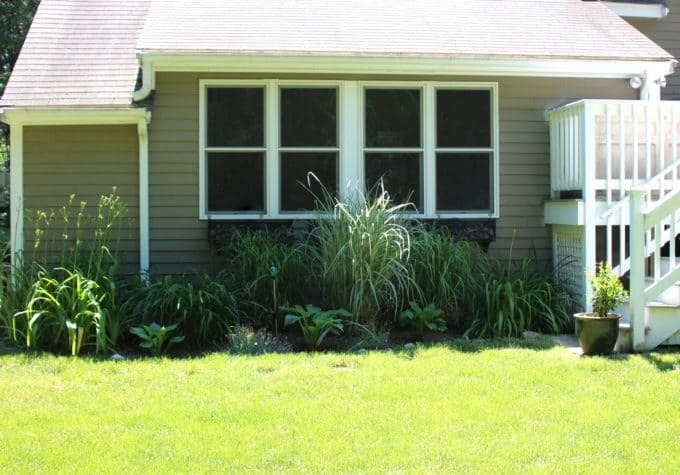 But definitely one of my favorite projects ever….we are so looking forward to using this space this summer! Thanks for coming by! Then happy 45th to you too this year my friend! Thank you for your kind words. We’re excited about this project despite the fact that there is a lot of grunt labor ahead! I’ve never gone thru most of what you did here, but thanks to you, when the time comes, I’ll know what to do. Good that you had your son with you. Can’t wait to see the next phase of this project!